The confocalDT measurement systems offer highest precision along with maximum speed. 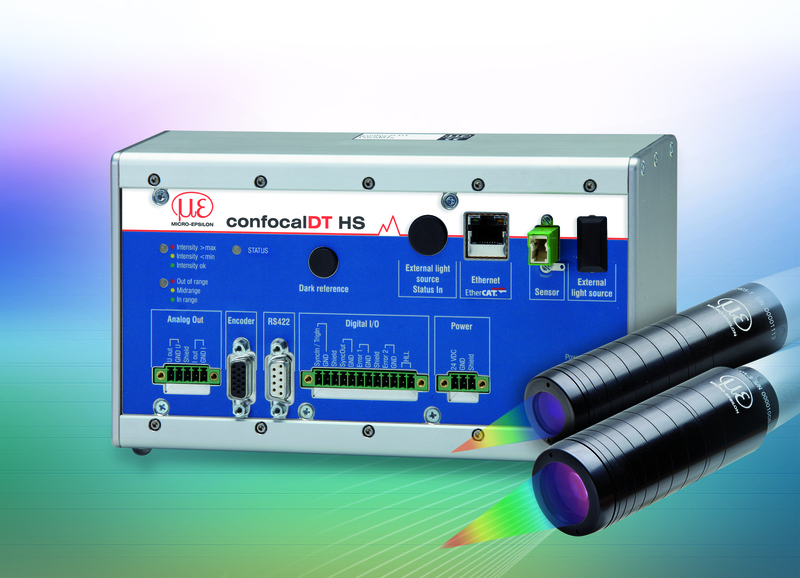 The confocalDT 2471 HS is compatible with all sensor types of the IFS series. An active exposure time regulation feature allows different surface types to be measured quickly and precisely even with dynamic processes. A large range of sensors and different controller interfaces open versatile fields of application, e.g. in the semiconductor industry, glass industry, medical engineering and plastics production. In contrast to systems using an oscillating lens, confocalDT is entirely wear-free. The sensors are designed for passive measurements and do not need any electrical components. They do not give off heat, which makes them suitable for use in sensitive environments. Due to a user-friendly web interface, the entire configuration process of controller and sensors is carried out without using any additional software. The confocalDT 2471 HS is used for fast distance and thickness measurements of highly reflecting surfaces. Compared with a Xenon light source, the integrated light source is more durable, resulting in reduced maintenance and purchase costs. An active exposure time regulation feature allows different surface types to be compensated for quickly and precisely even with dynamic processes. Two different controller versions are available: the standard version and a multi-peak version. The latter enables one-sided thickness measurement of transparent measurement objects with up to five layers. The high-speed controller is compatible with all sensor types of the IFS series. Data output is via Ethernet, EtherCAT, RS422 or analog output. Materials are stored in an expandable materials database. The controller is primarily used for high speed measurement and monitoring tasks in the glass and electronics industry.